I've read a lot about no till. For those who don't know, no till gardening is simply not tilling or otherwise turning the soil ever. Not with a tiller, not with a shovel, not even with a spading fork. Just add more compost, fertilizer, or other amendments to the top, don't ever let it dry out and die, and let Ma Nature do the work for you. Tempting thought, that. Not having to do all the hard work of digging in so many yards of compost. Not having to soak in a hot bath afterwards. Not having to ache for a week even after the hot bath. Letting my spading fork rust in the corner. But the idea that I had to turn the soil to work in amendments ran deep. It was so ingrained in me that I pooh-poohed no-till, thinking it wouldn't work. This, despite knowing that raised beds stay softer with just a fork - a large departure from the till-the-entire-plot-with-large-machinery way of thinking I grew up with. Despite me being halfway there already, I just didn't believe enough in no-till to actually try it. Last year, sometime about the end of September, I started getting ready for October planting. I had two beds that I hadn't taken good care of at all. They were unmulched, unplanted, dried out, and the summer sun had baked them solid. They were hard as rocks, those beds. I couldn't even get my spading fork but a couple or three inches down into the soil. When I did manage get a few inches of it turned over, it was a dry light brown color with little or nothing moving in it. It just plain looked bad. Because it was dead. I immediately thought, "Experiment time!" Well ... more accurately I thought, I don't want to dig this. I don't want to work this hard. Don'wanna-don'wanna-reeeeallydon'wanna. So I thought I'd give this no-till thing a try. I'd already sort of done it when starting new flowerbeds. I'd previously laid down three inches of good compost and left it, only watering it to keep the compost alive, then when I'd come back in a month I'd find the soil below remarkably soft. So again, I already knew the concept would work. I guess I'm just hard headed. I dusted the beds with dry molasses, then sprinkled some earthworm castings and humate over that. I then spread on an inch of compost, topped it all with bio-dynamically grown hay as mulch, then watered them as if there were something newly planted in them. A week later, they were soft enough to plant transplants in with only a hand shovel and minimal effort. Those transplants went on to grow like gangbusters. I was so impressed with the way they took off, and how little work I'd done to make them do so, that I kept going with it. I didn't till the kale bed, the garlic bed, the onion bed, or the potato bed. If you've been following my blog, you can see how well they're doing. I'm giving Findhorn a run for their money. I decided to keep this going through spring, so when Michael Ford came out to give me a hand, he just spread the compost on top and I set the sprinkler timer. When he and Heather came out to plant tomatoes, we found soft soil in all those five beds we dug in. Amazing. While planting some pepper transplants the other day in a bed that hadn't been turned for a year, I was so surprised and impressed with what easy digging it still was that I had to take some pictures and make a post about it. Those pictures are the ones you see here. As you look at them, keep firmly in mind that that bed has not been turned at all in an entire year. Last spring, I turned in some compost and fertilizer like usual before planting peppers in it. Eight or so months later, after the peppers were frost killed, I didn't plant anything in it, but did keep it covered with mulch and well watered all winter. 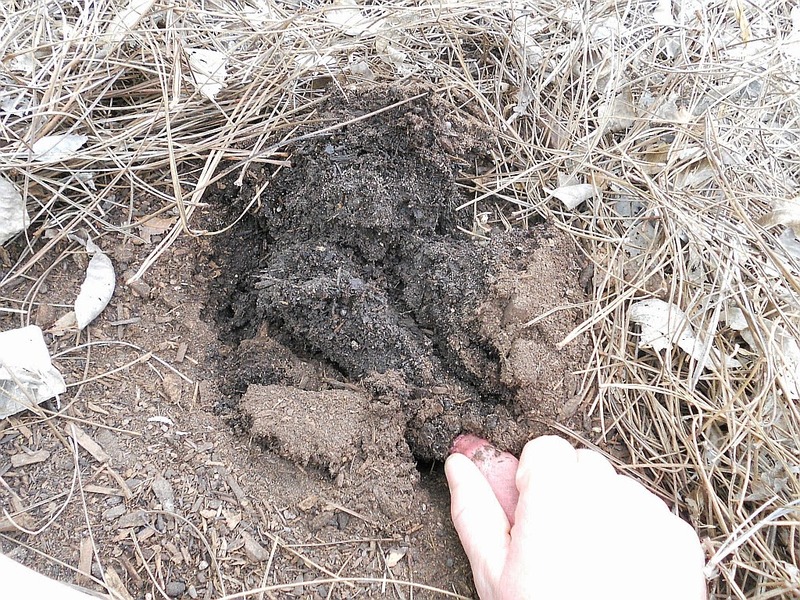 About a month ago, Michael Ford put more molasses, earthworm castings, and compost on it, then put the mulch back. No tilling or turning at all. 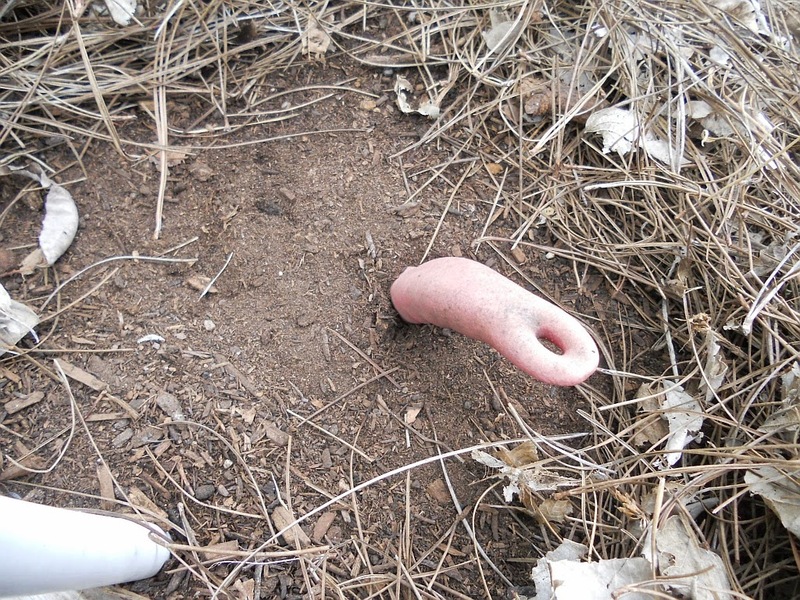 As you can see, the soil is still incredibly soft. As I started to plant the peppers, I plunged the trowel into the soil and fell forward a little bit, almost falling on my face into the bed. I wasn't ready for how easy it was. Like picking up a lava rock. Ha! The first picture above is of the bare soil with the mulch pulled back. The second picture is just after that with the trowel stuck in as far as I could get it easily. 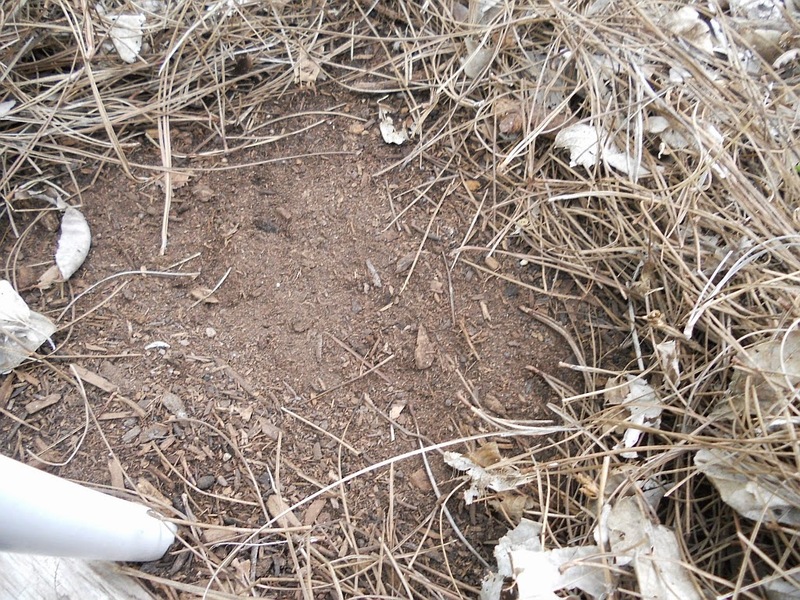 The next picture is starting to dig - you can see the color of the soil as the moisture level transitions from dry on top to like-a-well-wrung-out-sponge below. Next one, up there above this, is the trowel standing up in the hole I'd dug. I stopped when it got a little firm and harder to dig. Down below and to the right is a picture of the trowel, showing the inch lines. The whole thing is about a foot long. After that is a shot of the soil. Yummmmmmmm! 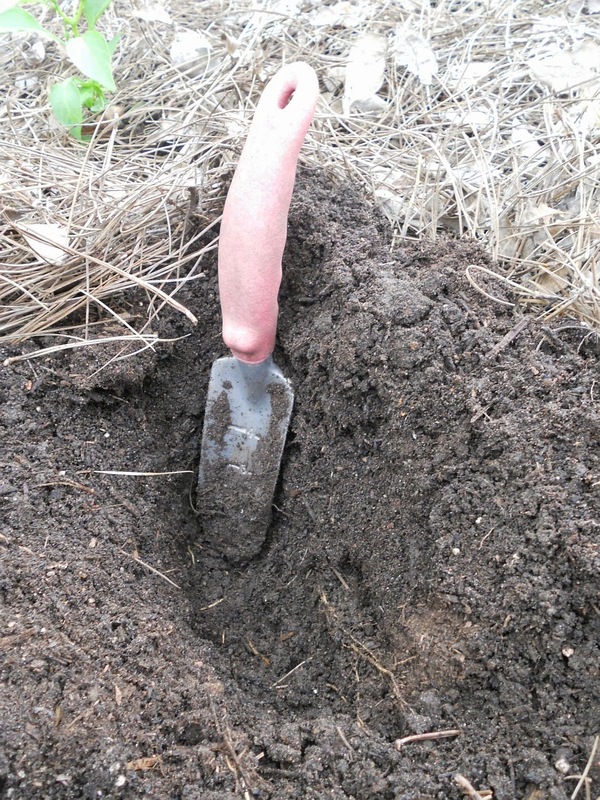 And last, the trowel buried in the hole to show just how deep down the soil is soft. Yeah, that's how far I'd dug with minimal effort - I'd stopped digging as soon as I started grunting. Like I said above, I'd done some reading about why this works and why tilling or turning the soil is bad. The gist of it is that certain soil bacteria, fungi, and other little boogers live in certain levels of soil. Some live a shallow few inches down and can't survive deeper while some live deeper and can't live shallower. When you stir up the soil, you mix them all up and they're not at the level they originally were. Some of the shallow-dwelling ones are still at the right place at a shallow depth, but many are now too close to the top or too far down deep. Those up top or down deep will die, while the ones who got lucky and landed at the correct depth are still not out of the woods. They're suffering a big set back - they have to take some time to readjust before they can get back to normal living and reproducing. The same goes for the deep-dwelling ones - some die, and the rest have to readjust. It's as if someone took the Earth and shook it. Some of us humans would land in Antarctica and die. Some would land in the middle of the Sahara and die. Some would land back where we are acclimatized, but it would take those of us lucky enough to land there some time to find homes, start finding food, and then become healthy enough to reproduce. Not to mention the injuries we'd have to heal from (like the fungal bodies that are ripped apart when soil is disturbed). Multiply that out with all the animals and plant life on Earth and you can see what a mess it would be. Aaaaaand ... then there's the sad shape the infrastructure we'd built would be in after The Big Earth Shakeup. Our roads and buildings and gardens - smashed. We'd have to rebuild all that before we could get around well. The same goes for the organisms in our soil. When you churn up the soil, all those little pathways the ants and springtails and soil mites and earthworms had built now have to be rebuilt. Those pathways are part of what keeps the soil soft and open. The organisms left, the ones not killed by the tilling itself, have to rebuild all that. And since there aren't as many of them as there were, they won't build it back as well as before you mucked it all up. Oh, eventually they will - after they've found food, homes, and gotten healthy enough to reproduce. But how long does that take? The very foundation of organic gardening is keeping the soil alive. If keeping the soil alive is so important, yet tilling or turning kills some of it, then what in the hell are we doing tilling and turning? Shouldn't we rethink that? I have. And unless this year is an unmitigated disaster from no other obvious cause, I don't think I'm ever going to till those beds again. Something else I've noticed: there aren't as many weed seedlings in the beds this year. In the future, I should turn one bed and use it as a control in this continuing experiment, but best I can remember there were many more weed seedlings last spring. Maybe it's a weather difference, maybe it's that I've been more diligent in pulling weeds before they went to seed (yeah, right), or maybe it's something else. But Occam's Razor says it's because the soil wasn't disturbed. Turning the soil brings more weed seeds to the top, plus many of them only need a millisecond of sunlight exposure to trigger them to germinate. If you leave them buried and don't expose them to light, logic says they won't sprout. When telling people how to plant turfgrass seeds at work, we caution them not to till for this very reason. So maybe it's not just my faulty memory or imagination. Man, if this is another side effect of no-till, I'm doubly sold! So give it a go. Dust on some molasses to sweeten the soil, to give the bacteria et al some energy. 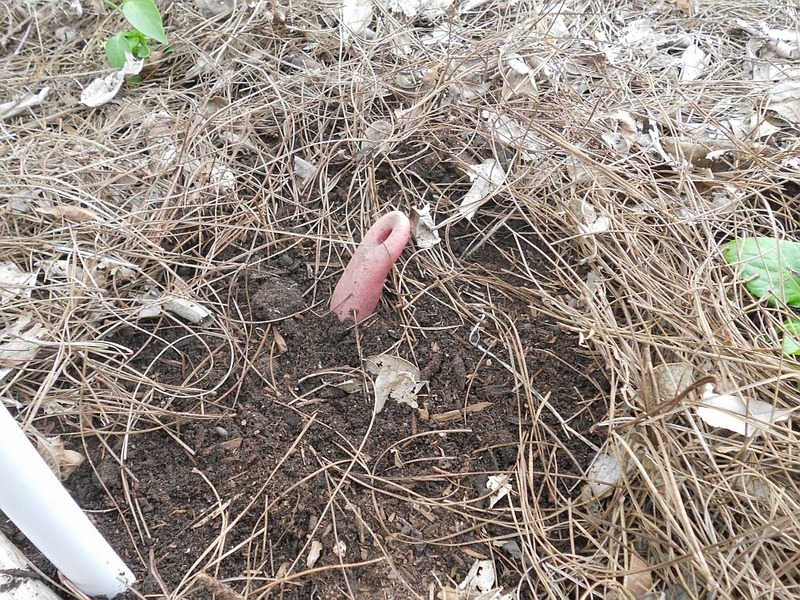 Add some earthworm castings to increase the fungal life. Throw in some humate if you like - though it's not imperative, it'll grab nutrients and moisture like a sponge only to let it go later, when things really need it. And top the whole thing with one of the most, if not THE most, important ingredients: compost. Lots and lots of compost. Tuck it all in with a thick layer of fluffy mulch and water it as if something were growing there. Because it is. I'm going to spend my extra time in a hammock, in the shade, mint julep in hand, watching the garden grow. What are you going to do with yours? Add molasses (liquid works, too - see more info in #1 below). Add other amendments if you want. 2. Add other amendments if you want. This is personal choice and not imperative. If you're going to be planting soon, in the next few weeks, you might want to add your dry fertilizers now. 3. Add compost. One inch spread evenly over the top of the bed. If you want to put more on, go for it. 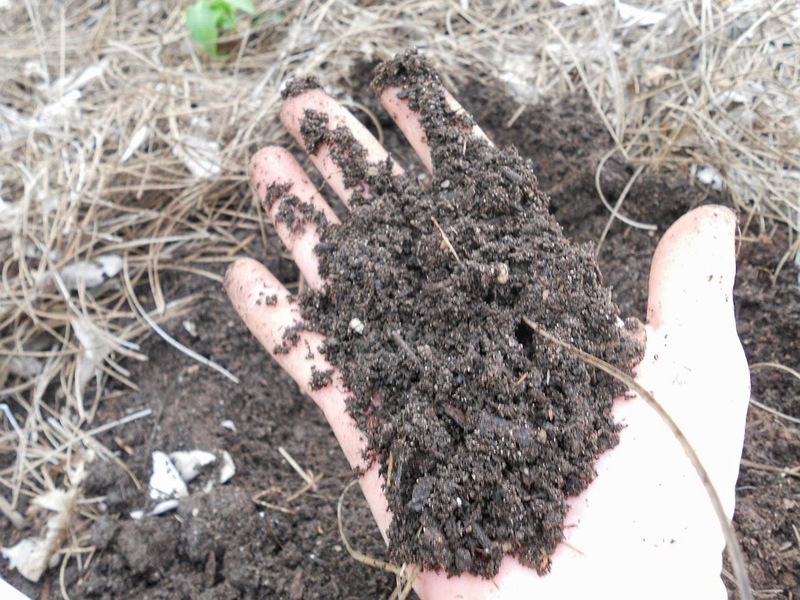 If you think the soil is already organic-matter-rich enough, use less. But do use some. 4. Top with mulch. Enough so that you can't see the soil at all. I like mulch made from leaves of plants. Pine straw is pine tree leaves, un-sprayed hay is grass leaves, straw is oat or wheat leaves and stems, etc. 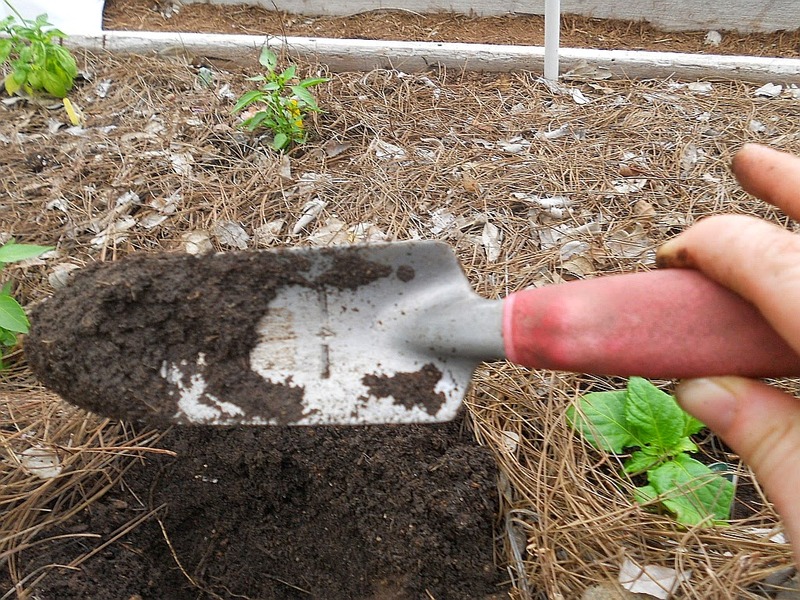 This type of mulch stays looser to let water penetrate easier, is usually lighter in color so keeps the soil cooler, is easier to rake back when you want to add more compost, breaks down into compost faster, and doesn't tie up as much nitrogen if you accidentally mix some in with the soil when planting. Wood mulches pack sometimes, are usually darker in color so the soil below is warmer, aren't as easy to rake back, take longer to decompose, and tie up nitrogen if you get some of it incorporated into the soil. 5. Water regularly. I can't say how often since there are too many variables - type of soil, what the temperatures have been, whether or not it's been windy, etc. Just stick a shovel into the soil, pull back on the shovel to open a divot, stick your finger in, and feel. If it's dry two inches down, it's time to water (refer to the third picture above where I start to dig - I watered a day or two later.). Water enough to really get it soaked in down about six inches or so (stick that shovel in to see). You want to wet the top two inches that was dry, and give the soil farther down some more water to replace what had drained/dried out. Then leave it alone until it's dry two inches down again. Now, go on about your life for at least a week, reveling in not having to do all that work of turning the soil. Then come back and see how soft the soil is. Lastly: be amazed, and throw away your spading fork. What do you recommend if the area is covered in weeds? Hi, Ron! I hope I'm not too late to help you. If it's a new bed, covered with weeds, I recommend double-digging to loosen the soil, to be able to pull all of the weeds including their roots (if you just grab and pull without loosening the soil, they'll likely break off and sprout back from those parts left in the soil), and to incorporate large amounts of amendments such as compost. After getting the soil loosened that first time, you can then switch to no-till. If all that is too much work, you can sheet mulch, build a raised bed frame on top of that, and fill it with soil - then you can go no-till. Come in to the Natural Gardener and talk to me at the Info Desk. I'll give you a handout on how to sheet mulch. It's not too hard, but there are a few steps, too many to list here (I really need to make an entire post out of that one!). I'm experimenting this year in my garden with no-till and this is a very helpful post. I hadn't heard about adding molasses before. Where would you get that in dried form? Great, Rory! I'd love some feedback here on how you do. I get the molasses at work, at the Natural Gardener. Right now, the 6 lb. bag is about $11 and the 50 lb. bag is about $35. I'm thinking I add a couple cups per 50 square feet, just scattering it on top of the ground all over the bed. Good luck! I hope you do well. I will look at my local gardening store -- but are there any substitutes to dried molasses? I'm trying to get these beds in this weekend. Thanks! Well, I'm too late to help you get those beds in on time, Rory. Sorry! But a good substitute for dried is just regular liquid - about a quarter cup mixed in a gallon of water. Two gallons of that in a 4'x8' bed should be enough. More won't hurt, so if you feel like it, do half a cup per gallon of water. I did put that in the instructions above, but it's kind of buried. I'll edit the post to point it out more.